The past couple of days FFA Members all over the state have put their welding skills to the test! The state welding contest reviews member’s knowledge in an individual test, a team activity, and working in the shop to complete the correct welds. The welds the member complete are judged and graded after the contest. During their time in the shop members are working in the shop they are being judged on their safety practices, using the equipment correctly and if they’re wearing the correct clothing. There were four locations that the contest was held at: Delphi High School, Vincennes University, Jay Everett Light Career Center, and the 4-County Area Vocational Cooperative provided the shop area, test rooms and the machines needed for the night. Once all the scores of each member are tallied from each location they will be compiled and our top 4 winners will be awarded at State Convention in June. A big thank you goes out to all of those who provided the area to hold the contest and the members who came out to compete. As I look at the countdown clock that hangs on the wall in our office, I am reminded of how not only is it counting down the time left to serve the Indiana FFA as state officers, but there is a much bigger clock that is counting down ALL of our time. How will we make it all count? One of the ways that I enjoy “making it count” is by visiting FFA chapters at their annual chapter banquets. 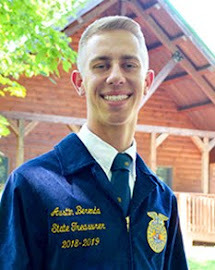 These banquets are not only filled with some awesome fried chicken and pitch-in meals, but FFA members, parents and supporters that understand that FFA helps make a positive, lasting difference in the lives of students. 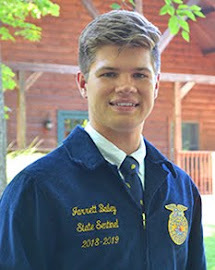 From the countless award pins, plaques, and trophies, FFA members all over Indiana (and all over the US actually) are being recognized for incredible achievements that are making a difference. 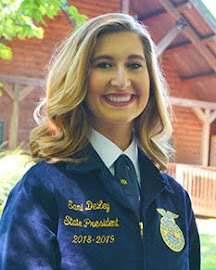 At the chapter level, FFA chapters are doing some pretty awesome things. From various service projects and multiple community activities, chapters across the state are “Making it count”. 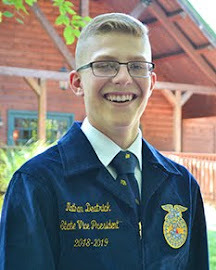 As I look back over all of the achievements of Indiana FFA this year, I see nothing but potential as I look forward. So, with all of these things in mind, I believe that instead of the clock in our office counting down, I think it is actually counting up. It is counting up the success of this year and the potential of next year. Is your clock counting down or is it counting up? 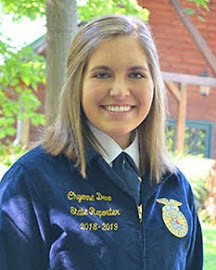 The Indiana FFA State officers have once again been on the road traveling the state of Indiana. As we broke up into pairs we all went our separate ways. This time however we were not presenting, speaking at a banquet, or promoting the FFA and agriculture at an event. We were traveling around visiting the District Stars in Indiana, choosing the winners in the 4 categories. Students compete to be the District Star in Agribusiness, Star in Agri-science, Star Farmer, and Star in Agricultural Placement. Once a winner has been selected at the district level, then they compete for Section Star in their respective areas. Once the Section Stars have been chosen, they will then compete at State Convention in June for the title of State Star. Four state stars will be chosen for Indiana. At these visits we get to see the hardwork and dedication FFA members are putting into their Supervised Agricultural Experiences. We have toured dairy farms, beef cattle operations, commercial hog operations, family farm business, and even very own businesses that members have started. We spend our time reviewing the submitted applications and seeing the students hard at work as we visit these places. Students even have the opportunity to compete at the National level in the same 4 categories in hopes to become a national winner. These members have endured extensive hours of work and really tell the story of agriculture. Congratulations to all the District and Section Star winners!! During our high school career, my teammates Kelly Blackburn, Micah Matlock, Morgan Dawson and I all attended the Washington Leadership Conference. There, we defined our purposes as leaders, learned the importance of valuing people, created action plans to live that purpose out, and finally to serve others by combining those three concepts. One service project touched on during the conference was Toms Shoes... a company with a One For One mission... you purchase one pair of shoes, and another pair of shoes is sent to someone who really needs them. In some developing nations, children must walk for miles to food, clean water & to seek medical help. Cuts & sores on feet can lead to serious infection. Often, children cannot attend school barefoot. In Ethiopia, approximately 1 million people are suffering from podoconiosis, a debilitating and disfiguring disease caused by walking barefoot in volcanic soil. Podoconiosis is 100% preventable with basic foot hygiene & wearing shoes. We shared these facts with our teammates. So, while Miss Megan Klotz & Miss Janna Oxford were touring Section II for Star Visits, Nellie Bell joined us 4 W.L.C. 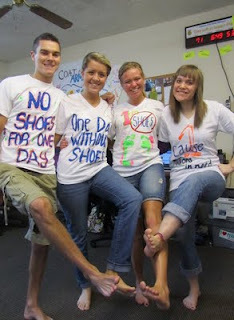 graduates in Toms 1 Day Without Shoes. After traveling the State for Chapter Awards Banquets, I traveled barefoot into Chase Bank to deposit my expense report check. Nellie went to Goodwill to return some costumes for leadership conferences, where her lack of shoes went unnoticed. Dawson enjoyed having her oil changed while we all kicked up our bare feet in the waiting room of Jiffy Lube in Greenwood. There is a Native American proverb that says "Do not criticize a man until you have walked for a day in his moccasins". Why not walk a day without moccasins, and then aid a child who does just that every day? 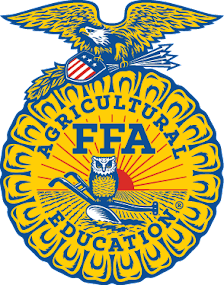 One extremely important component of FFA is F-U-N! Last night our team was able to join in on some MAJOR fun that the Scottsburg FFA and West Washington FFA Chapters hosted at the 1st Annual Scottsburg FFA and West Washington FFA Barn Dance! 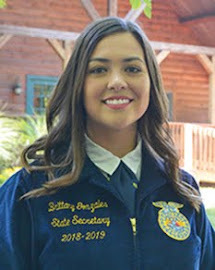 After buying the State Officer Team at one of the leadership conferences a few months ago, members and advisors of both Chapters came up with the idea to hold a barn dance and invite the State Officers as well! If I had to guess, I don’t think anyone initially thought it would be as awesome as it ended up being! Held in Washington County, Indiana, the family of a West Washington FFA member donated their barn for the dance to be held in…bought thirty pizzas for us to eat…and even paid for thirty more minutes of dancing before we called it a night! Everyone present had on matching barn dance t-shirts that were specifically made for the dance! Beth Nicholson of Beth Nicholson Photography was present taking pictures and capturing as much of the fun as her camera could hold! A DJ had lights all over the dance floor and a huge screen for the music videos of all the songs that were played! To add to the excitement, a Barn Dance Queen and Barn Dance Queen were selected and received decorated cowboy hats! Taylor Durbin and Lucas Gilbert, King and Queen and both of the West Washington FFA Chapters, then shared a fun dance together before everyone else joined in! After clean-up was completed at the end of the night, the officers of both Chapters presented a banner signed by everyone to the family that donated the barn and made the evening possible! From all of the dust that was floating around by the end of the evening, it is clear that cupid was without a doubt shuffled, boots were definitely scooted, and the electric had been slid! 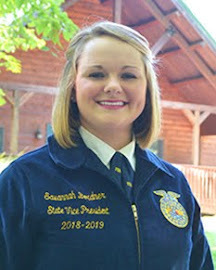 From my knowledge, very few Chapters have the bond that Scottsburg FFA and West Washington FFA have, which only assists their members in building the FFA relationships that will last a lifetime! Thank you Scottsburg FFA, West Washington FFA, and all volunteers for a great evening and tons of fun!